Contents: The lunch on the picture is a kind of pasta gratin with chicken and cheese. Not the most nutritious, but one of my favorite school lunches. 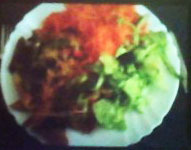 There's also grated carrot and a simple green salad with cucumber and tomatoes. Notes: Hi! I'm a 17 year old girl and I just came across this blog. I like the concept and I actually had a photo of one of my school lunches in my phone, so I decided to submit it. I took the photo so that I could prove to my little sister that my plate actually consist of about half vegetables. Not that it always does - sometimes I exaggerate a little bit. Anyway, the Swedish school system requires the schools to provide free lunch for all students, although the rules are different in the gymnasium (years 10-12, about 15-19 year old students) and some private schools require payment beforehand. My school has three dishes every day, one that is vegetarian, a salad bar, crisp bread (knäckebröd) and filmjölk with müsli or cornflakes. To drink, there is water, milk and three kinds of squash. That looks like one of the world's yummiest school lunches! I love that it comes with half vegetables...it looks like the Swedes know what they are doing. This is a policy that American schools should start to follow. Obesity is such an epidemic, especially for children. When they don't even have a healthy choice at school, where lunch is often provided for them, how are they ever supposed to be expected to choose healthy at home?